This, for the record, is exactly what my dreams are made of. 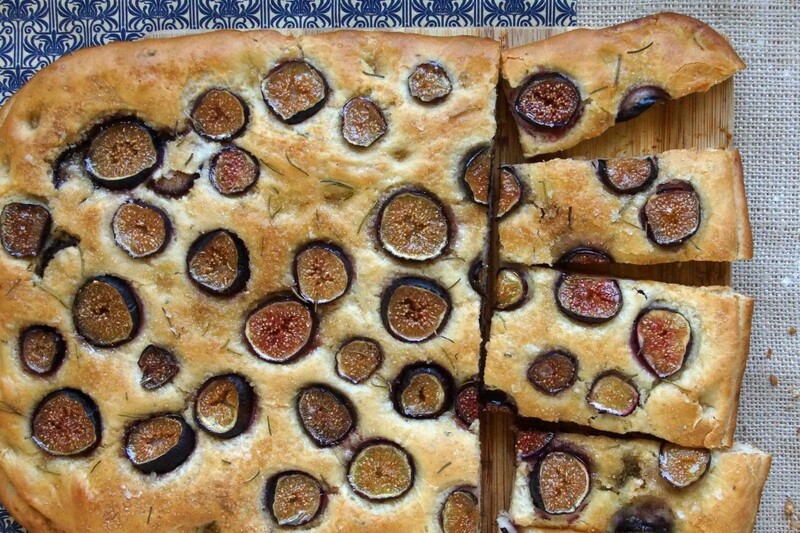 It’s a warm slab of schiacciata, studded with fresh figs, sprinkled with rosemary, sea salt, and sugar. It covers all of my crave bases: sweet, salty, carby, plus it reminds me of my one of my favorite cities. Schiacciata is, in my estimation, the official snack of Florence. It’s a dimply flatbread, a lot like focaccia, that’s really loaded up with olive oil. You can stop in to a panificio, stand in line with kids being treated to an after-school snack and old women on their grocery run, and hold your hands up to indicate just how big a slab of schiacciata you’d like. You might think you’ll bring it home, save it for later, but once it’s in your possession and you can feel that it is indeed still warm, you have no choice but to eat it right there, street side. It’s okay, you’ll be in good company. I can’t imagine anyone, young or old, being able to walk home without nibbling at least a corner. So that’s regular schiacciata, but come fall another sort of schiacciata descends on the lucky Florentines: schiacciata all’uva. That’s the one I’m riffing on today. Normally, it’s made with grapes, but because I don’t live under the Tuscan sun and do not have access to good, flavorful wine grapes, I’m making it with fresh figs instead. Sound good? Shall we get started? First, we’ll need to mix up the bread dough. Don’t fret; this isn’t an all day commitment–schiacciata or foccacia can go from idea to in-the-belly in about 2 hours. Stir yeast and a spoonful of honey into a little warm water and let it sit until it starts to look thick and bubbly. Mix in more water, along with olive oil, salt, and rosemary. Stir in flour until a sticky ball of dough forms. I love that you don’t need any fancy equipment; just a bowl and a wooden spoon will do the trick. Dump the dough onto your counter or a board and knead, incorporating more flour, until it is slightly sticky, but manageable. Place the ball of dough in an oiled bowl, cover it with a towel, and let it rise for about an hour, until it double in volume. Divide in half and stretch one piece into a rectangle on a baking sheet. 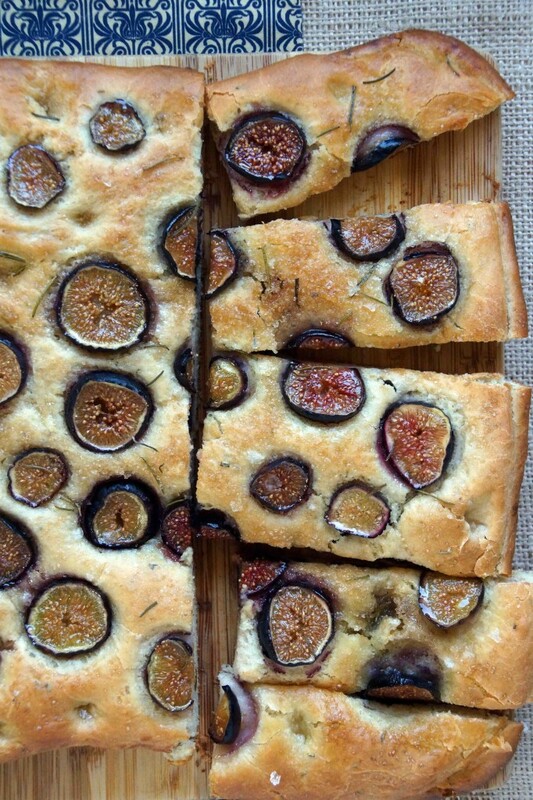 Scatter with sliced figs and sprinkle with sugar. 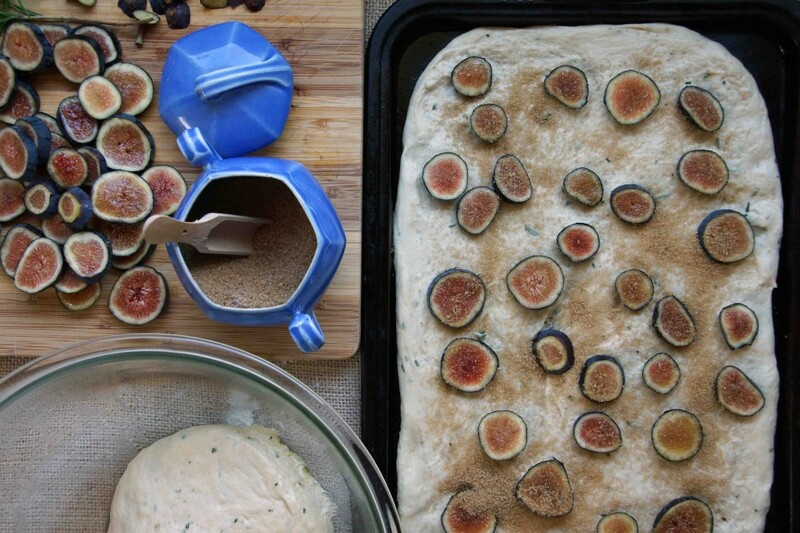 Stretch the rest of the dough into a matching rectangle and sandwich the figs with it. 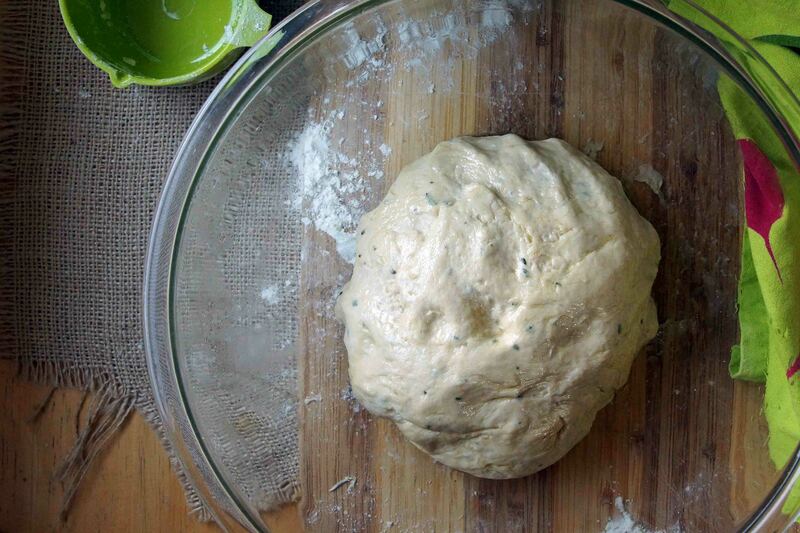 Use your fingers to (gently) smash the two layers of dough together. 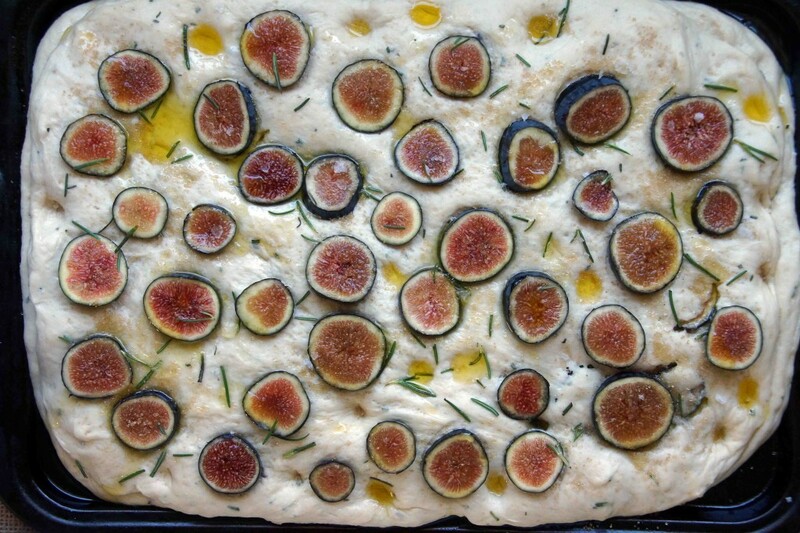 Lightly press the remaining figs over the top, along with more rosemary, olive oil, sugar, and sea salt. 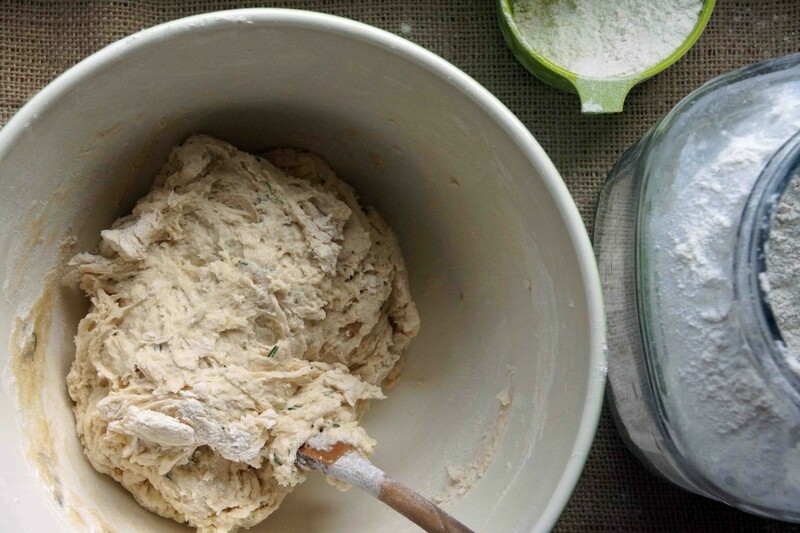 Allow the dough to relax and rise for another half hour while you preheat the oven. Bake the schiacciata until it’s golden brown and just starting to crisp at the edges. Cut yourself a slab, envision yourself sitting on a curb in Florence, and get at it while it’s warm. Schiacciata makes for a great afternoon snack or is delicious reheated until slightly crisp with your morning coffee. Dissolve the yeast and honey in ½ c. warm water in a large mixing bowl. Let stand until the mixture looks thick and foamy, about 10 minutes. Add remaining warm water to bowl, along with the kosher salt, half of the rosemary, and ¼ c. olive oil. 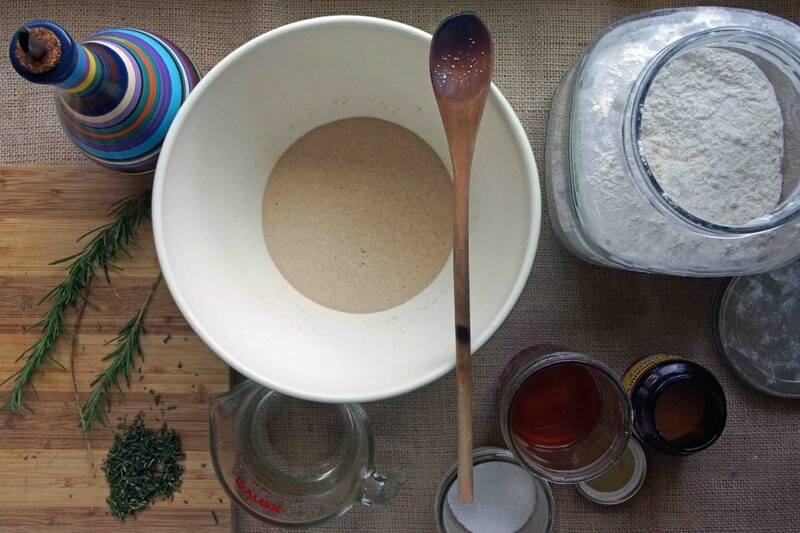 Using a wooden spoon, stir in about 3½ c. flour. 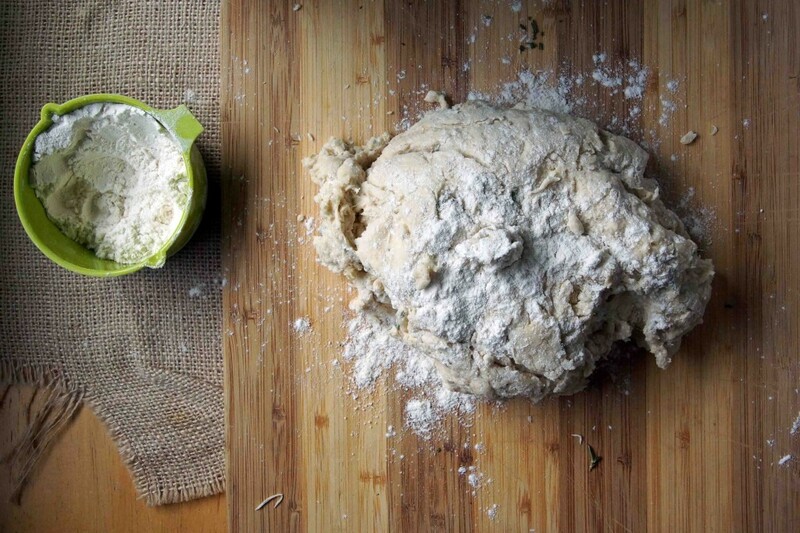 Turn the dough out onto a floured board or counter and knead, incorporating the final ½ c. of flour. Knead until the dough is manageable but still fairly wet. Place the dough in an oiled bowl, turn to coat all sides with oil, cover. Allow to rise in a warm place until doubled in volume, 45 minutes-1 hour. Oil a baking sheet. Divide the dough in half and stretch one half into a rectangle to cover the bottom of the pan. 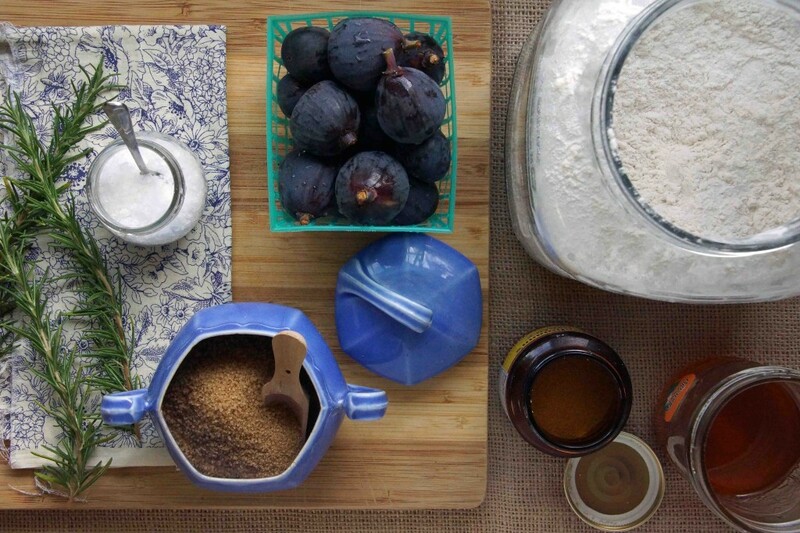 Scatter half of the sliced figs over the dough and sprinkle with half of the sugar. 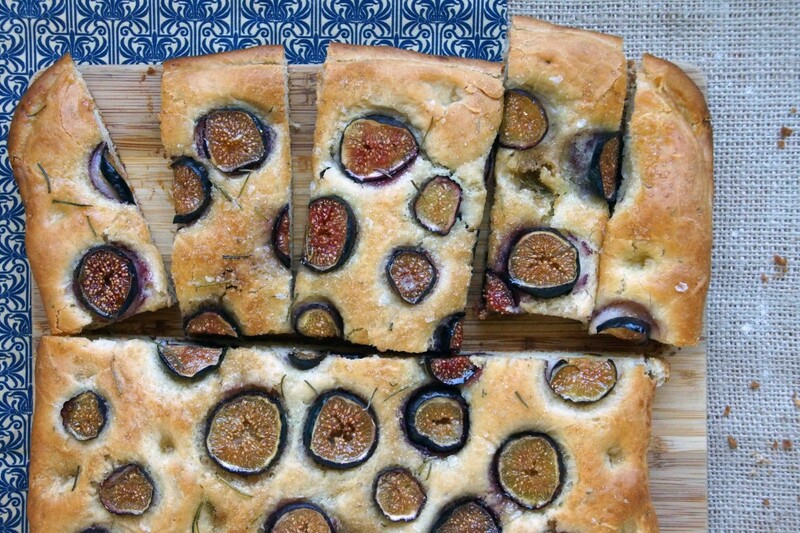 Stretch the remaining dough into a matching rectangle and layer it over the figs. Gently press with your fingertips to stick the 2 layers together. Top with the remaining figs, then drizzle about 2 Tbsp. 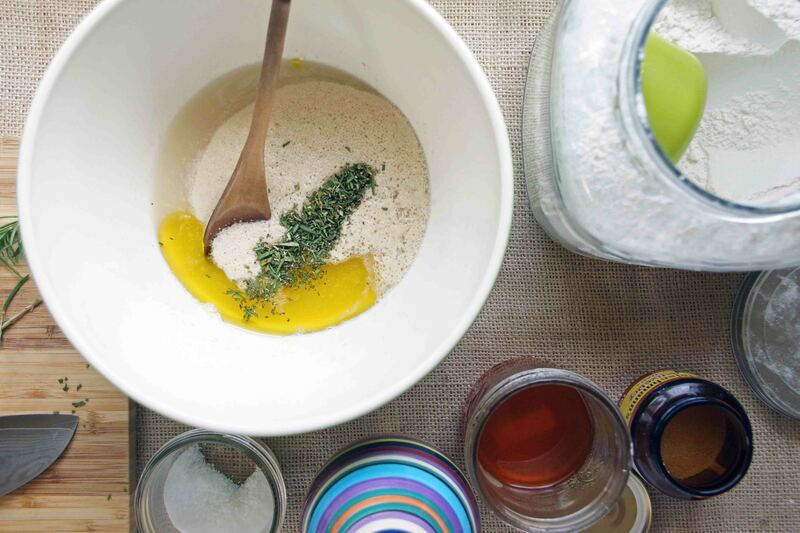 olive oil over the top and sprinkle with remaining rosemary, sugar, and sea salt. Loosely cover with a towel and allow to rise again for about 30 minutes while you preheat the oven. Preheat oven to 400°. Bake the bread until golden, slightly crisp around the edges and cooked through in the center, about 30 minutes. Schiacciata is best served warm from the oven. This came at the perfect time! 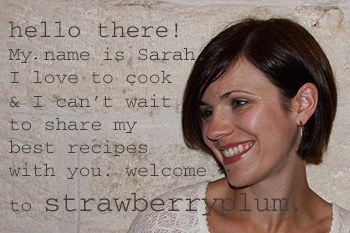 I have been looking for some sort of bread recipe to use up all my fresh figs (they were on sale a few weeks ago). Can’t wait to try this! So that’s why I worked for your husband last night! Hope you two liked it. 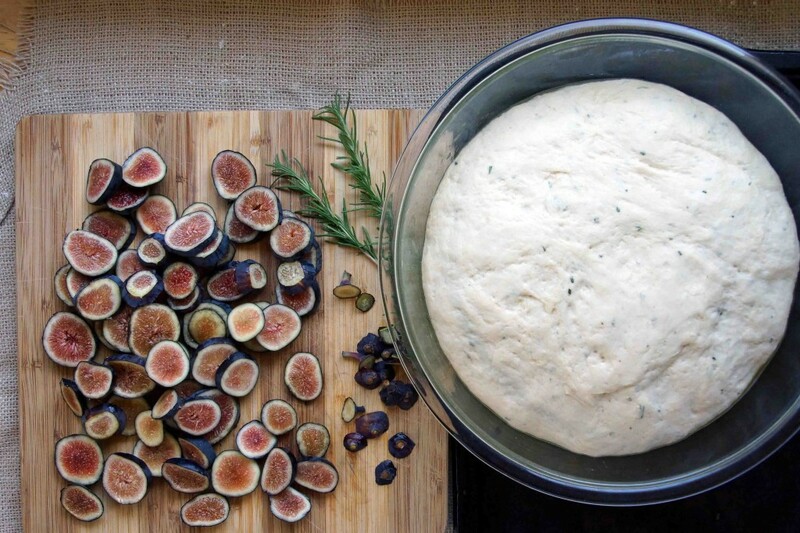 Also, ricotta & fig paste bruschetta sounds amazing! This bread is gorgeous!! 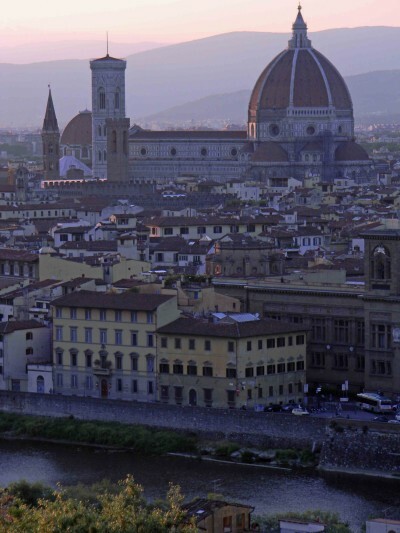 We went to florence this summer, and I can’t wait to go back. I’ll have to make your beautiful bread in the meantime to remind me of our wonderful trip. Good idea! Travel-inspired cooking is some of the best.